When people speak of a melody being singable, it means that the phrase are no longer than a good normal span of human breath. Repetition: Because music has no verbal context to unfold its meaning, the formal elements which create the substance and significance of music are all the more important. Of these forming elements, repetition of a tone or tonal pattern provides the best means of unification. Contrast: The interaction between contrast and repetition is just such a reciprocal relationship in which each element intensifies the other. The result is a synthesis of emphases, which contributes to a deeper and more integrated unification than either element alone could generate. In music, variation reinforces the constructive qualities of repetition and contrast, with the result that it provides one of the best structural means for continuing attention and interest. Climax, Focal point, Dominance: In the temporal arts, some emphasis in the particular medium is even more necessary than in the static arts. A strong climax will, so to speak, gather its flanking parts into a homogeneous apprehension. It often happens that the element, which saves a fleeting and vague perception of a temporal artwork from confusion is a strong dominating focal point. The emphasis of a particular word, gesture or tonal pattern can be the primary means of establishing the identity of form in such art media. The return: The return is very vital in the perception of the temporal arts; the memory must recall enough of the initiating phase of the art form so that the return can function as a third phase of the tripartition cycle, and then complete and unify the expression. The return may be expressed through a similarity of thought or gesture, a synonym of words, or a suggestion of previously used tonal or rhythmic pattern; but the psychological response of recognition of the familiar should always be attained. This criterion is unique in that its function lies in the distribution of melodic elements and material, which have just been previously used. Therefore, the composer should utilize balance as he approaches a pause or a close of melodic movement, for at these places he can best apportion and integrate in retrospect the interaction of the other elements. In painting, sculpture or architecture, balance is static and comparatively easy to grasp at a single glance. For this reason, the structural details of a static art form often approximate equal proportions. Because a melody is perceived in time, a balance of its elements becomes more difficult to comprehend than in the static arts. As a result of this temporal characteristic of appreciation, a melody rarely achieves an exact symmetry of repetition, contrast, climax and return, through a mechanical distribution of an equal number of measures. Having thought about these few points, it is important to still remember that one of the most important elements of developing and discovering a natural (organic) melody is by using your voice. Singing is very important when composing, but also when working with music in general. This melody has cadences tailored into it and thematic development, which I believe is why it’s so strong in itself. This four bar section from “Not” composed by Anders Jormin, consists of four devises / approaches / fragments / cells. The whole section creates a form/structure, which is the most famous of all. The AABA. Each cell establishes it’s own little statement. This first section of the piece has an underlying sustained D pedal and notice that the most important note in the melody is the A (the anchor, which maintains balance). Bar one introduces the tonality and flow of the melody and starts on the D and ends with an A triad. This can be considered as a melodic cadence. The I and the V (roman numbers). Bar three is the B section (the contrast) of these four bars and is a modulation of the same rhythm as in the second bar. 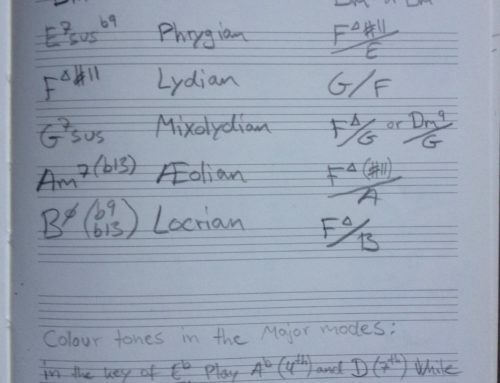 Bar four is the conclusion and reminder or “return” of the first mood/tonality of the melody, stating the A.